Women in trucking. Let me first start off by saying I am not a women I'm a 60 year old male driver who has been driving for 31 years. I don't want to mislead anyone who might think this article is written by a lady trucker. Unlike some of my fellow drivers who have forgotten what its like to treat a fellow driver who just happens to be female like a fellow driver I have the upmost respect for my fellow female drivers. That said this is my webpage on women truckers. Often I hear my fellow drivers remark that that trucking is a man's world. Women have no business in a truck and should be at home. The job is too demanding and stressful for a woman. What are these guys so afraid of? Are they so insecure and are afraid of there own masculinity that they can't admit that a women can do the same job as them? Sometime I just think that they are afraid that the other drivers may be looking at the women drivers and not at them (if you know what I mean). Statistics indicate that almost 200,000 women in the U.S. are truckers. More and more women are getting behind the wheel. Trucking offers flexible schedules, job security, competitive salaries, and the open road. The money is good for a woman looking to begin a trucking career. You get equal pay for equal work weather your a male or female. Some women choose trucking after their kids are grown or after a divorce. Or a woman maybe married to a trucker and may decide to drive team with her husband. I would say that the majority are husband an wife teams. There are not many other jobs where a woman can make the kind of money found in trucking unless they have a college degrees. The average entry salary is $30,000 to $35,000. After the first year or two that salary can jump to over $50,000 a year. Do you know what's on your DAC report. Do you know what your past and current employers are posting about you. You are entiled to one free copy of your DAC report per year.. Even if your not planning on changing jobs you maybe in the future. If there is incorrect information on you it may take up to 45 days to remove. Can you afford to be out of work that long? 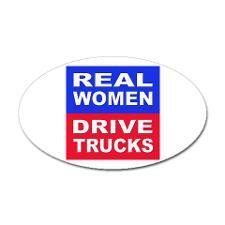 So good luck to all the women in trucking be safe and always be aware of your surroundings. Have A Great Story About Women In Trucking? Do you have a comment on women in trucking? Share it! All comments are welcome. Ladies, tell your story of your life on the road. Are you treated differ than your male counterpart? If so, in what ways. Do guys harass you or get on your nerves on the CB in the parking lot or truck stop? Have you been mistreated or abused by your trainer? Write you own story in your own words! What is it like to be a female driver traveling around the country or localaly. Please feel free to upload a picture of yourself and/or your truck. Share your storys to help other ladies cope with life on the road.